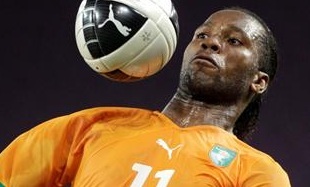 BlackwaterBLUE from monkster.com: Is Drogba set to join Anelka at Shenhua? Is Drogba set to join Anelka at Shenhua? Didier Drogba could be re-united with former Chelsea team-mate Nicolas Anelka as Shanghai Shenhua close in on their second major signing of the year. The Chinese club are reportedly confident a deal can be struck before Monday that will the the Ivory Coast international one of the highest paid players in the world. Anelka joined Shenhua earlier this month in a deal worth £200,000 a week. Shenhua's owner Zhu Jun said on the Chinese equivalent of Twitter: "It's like flirting with a girl. Perhaps she will resist you at first, but if you continue to ask her out, it always ends well. Never give up."